The Human Touch HT-5040 massage chair is design to not only fit your home decor, but also at the same time deliver a professional quality massage. The luxurious feel of the leather like material covering the chair combined with the massage will help to melt away your back troubles. 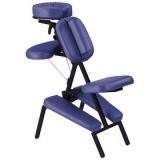 It the addition of the foot and calf massager your lower body will not be left out. 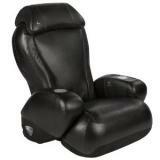 Human touch has created a perfect massage chair that is sure to fit in with most any home decor. It has a sleek style and it is covered by leather like nylon material that is bound to appeal to anyone. To help it fit in with most any decor you can get the HT-5040 in a variety of colors like; Black, Expresso or Butter. This Human touch massage chair can be bought through Amazon.com for a 19% discount. I couldn’t find a better price anywhere else. Click here to check it out. 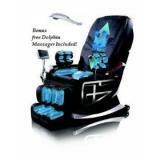 The Human Touch HT-5040 massage chair is programmed to deliver 5 distinct massage techniques; rolling, kneading, percussion, compressing and the combination of percussion & kneading. Along with the aforementioned massage techniques you will be able to select from three massage programs; full body, stretching and foot and calf. All of the programmed settings are controlled by the attached remote control. Click here to SAVE $504 on the Human Touch HT-5040 Massage Chair for a limited time only! The massage mechanism includes 3 motors (power recline, quad roller and raise and lower) and the quad roller massage unit rolls the full length of your back. The there is also a width control on the roller head to allow the chair to spread the relaxation across all of your back. The HT-5040 massage chair by Human Touch has a couple of unique features like its swivel base that turns 60 degrees. 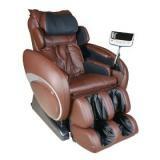 It also features a hide-away calf and foot massager that flips over to reveal a flat leg rest when not in use. After looking at the reviews posted online for the HT-5040 massage chair it is apparent that it is well-liked massage chair. The comments have been nearly all positive. 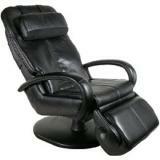 One reviewer really liked the power recline feature making it effortless to put it in the full stretched out position. Another reviewer thought that the massage delivered by the quad roller head was very close to what you would expect from a spa. Another reviewer was very impressed which style and feel of the chair itself and thought that it did fit perfectly into the decor of their home. The only negative comment that I could find was from one person that did not think the massage action was as smooth as some of the higher priced massage chairs. Click here to read more reviews. Based on the reviews and mostly positive comments I would have to highly recommend the Human Touch HT-5040 for anyone looking for a great looking massage chair that delivers as advertised. 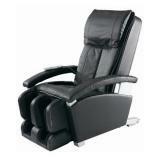 How would you rate the "Human Touch HT-5040 Massage Chair"?